In conjunction with the beginning of Russia’s longest school holiday, Moscow’s famous Olympisky Arena hosted a 2-week children’s project, Circus of Ded Moroz – 2 (Father Frost’s Circus), at the end of December 2013. In order to showcase a stunning, mystical fairy tale light show, Euroshow and lighting designer Alexey Zhuravlev deployed a world-class lighting system featuring Martin Professional fixtures. Euroshow supplied lighting fixtures for the event surrounding a large Christmas tree which included: 36 MAC Viper Profile, 20 MAC 2000 Wash XB, 12 MAC III Air FX, 48 MAC Aura, 96 MAC 101, five Atomic 3000 DMX, 30 RUSH MH3 Beam and three Jem Ready 365 Hazer fixtures. The New Year’s project for children at Olympisky has gained a traditional status already, but for Zhuravlev, it was his debut. Producers of the event knew about Zhuravlev due to his successful work with numerous clubs and concerts, so they invited him to implement the basic idea of creating a dynamic event that children would love and remember. 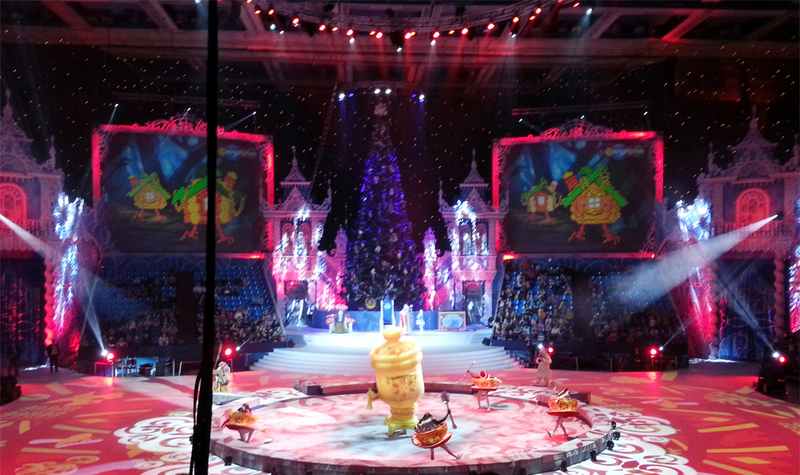 The main story of the Circus of Ded Moroz - 2 was influenced by an enormous event – the 2014 Winter Olympics in Sochi. Fairy tale characters from different stories and different countries met each other on the arena space to compete for the highest sports prizes. This story needed a bright and colorful setting, something totally different from traditional theatrical drama. Because some events in the program featured aerialists in the space below the roof, it was necessary to change the lighting concept and make accents on the flights in midair. Zhuravlev chose the powerful MAC III AirFX fixtures based on a 1500W lamp and the new Jem Ready 365 fog generators in order to work with the challenges. For the circus arena area, Zhuravlev deployed the MAC 2000 Wash XB, MAC Aura and MAC 101, along with the MAC Viper Profile with the gobo #1, which served as the main lighting tool. The MAC Viper also played a familiar role for Zhuravlev, creating bright and powerful projections that draw beautiful pictures on the surface.